← Your energy data — Who wants it and what can they do with it? 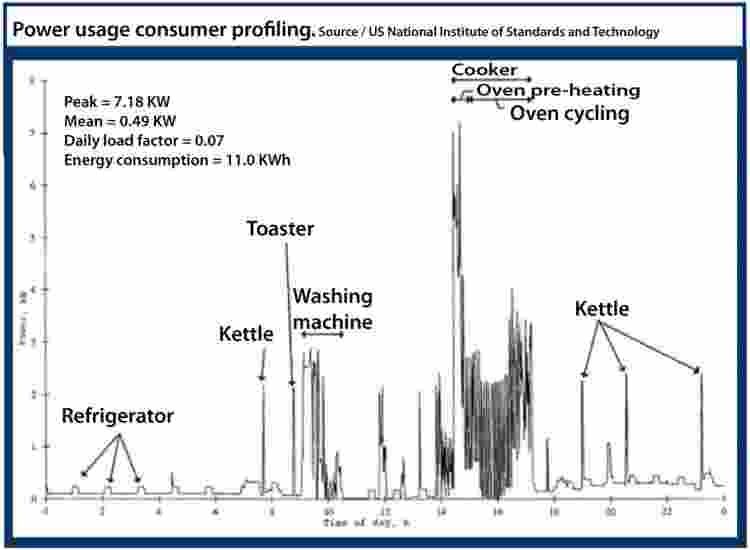 You Sure Drink a Lot of Tea: Smart meter data can show what’s going on in a home, because tea kettles, toasters, and other appliances have identifiable load signatures. Back in 2007, when the Dutch government announced that all 7 million homes in the Netherlands would be equipped with smart meters by 2013, it anticipated little resistance…But consumers worried that such intelligent monitoring devices, which transmit power-usage information to the utility as frequently as every 15 minutes, would make them vulnerable to thieves, annoying marketers, and police investigations. They spoke out so strongly against these “espionage meters” that the (Netherlands) government made them optional. It all sounds less paranoid when you consider that each appliance — the refrigerator, kettle, toaster, washing machine — has its own energy fingerprint, or “appliance load signature,” that a smart meter can read. Anyone who gets hold of this data gets a glimpse of exactly what appliances you use and how often you use them. IEEE — the Institute of Electrical and Electronics Engineers — is a professional and industry organization. Smart Meters collect finely detailed personal energy usage data and wirelessly transmit that data to the utility company and to whoever has access to the feed. The level of detail collected by the meter can also be increased. Individual privacy was considered so important as to be enshrined in the California Constitution. This is an invasion of our privacy. Tech companies are poised to gather unprecedented insights into consumers’ lives– how much they eat, whether they exercise, when they are home and who they count as friends. Silicon Valley is in a gold rush for information, highlighted by Google’s announcement Tuesday that it would incorporate data posted by users on its social networking service into the results of its main search engine. Microsoft’s Kinect game console collects some biometric information that Chief Executive Steve Ballmer said on Monday is a potential springboard for health-care and other industries. Aside from the home consumers, let’s imagine a company’s data center is making energy efficiency a top priority. The company management is keen on monitoring energy and reporting usage back to the grid. The data center facility controllers will communicate with smart meters and send data to the utilities to be analyzed. If in some way this data is leaked, it could pose serious issues to the overall security posture of the company and data center. The profile at the beginning of this section is from the National Institute of Standards and Technology. Much finer data collection is planned through the Home Area Network (HAN), with transmitters in all appliances, and additional “Smart” devices. The UCLA Smart Grid project installed wireless sensors in rooms which can tell how many people are in the room. These “vacancy sensors” are becoming required in new building codes.